Flying can be a hassle. From getting to the airport & checking in, stripping down for security to baggage claims. 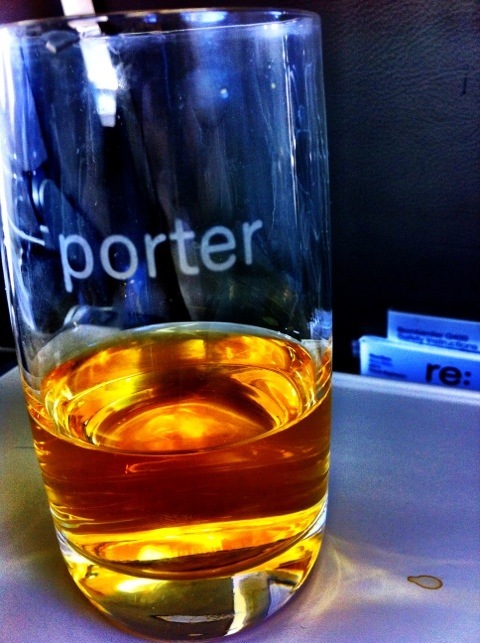 One thing I can’t complain about is Porter airlines. From the moment I get to their lounge at Billy Bishop Airport to deboarding the plane. Once you make your way through security and get to the bottom of that escalator, all the hustle and bustle seems to stop when you hit their comfy lounge. I sooooooo look forward to getting to their lounge and sipping on the complimentary espressos and cappuccinos. Have a seat on their cushiony sofa chairs and people watch. Yes FREE goods!!!! Doesn’t the word FREE sound so weird on a plane? I know the free beer is making me light-headed while I write this but I’m not kidding you. FREE beer or wine!!! Hic! 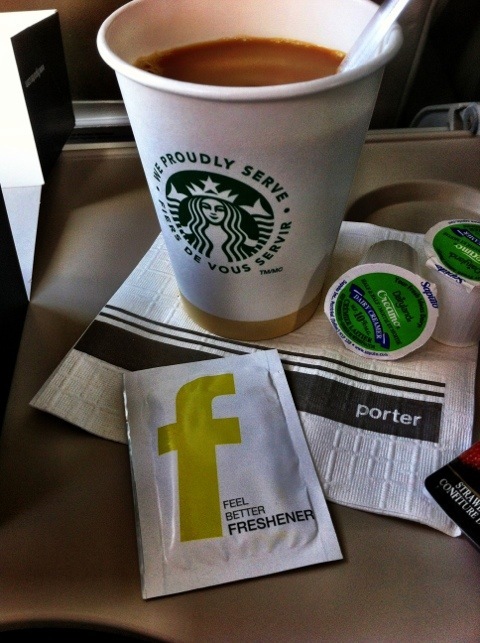 Seriously though, this is just one of the many reasons why I can’t complain about this airline. We also get……….wait for it……..FREE food!!!! I know, I know, you probably think I’m hallucinating or the beer has gone to my head but for reals!! FREE food!! At this point you are wondering why am I going on about an airline on my food blog right? Well, not only did they serve food but the real kicker is that it’s yummy too! They served me with a cute little box and when I opened it up there was a nice little chicken pesto wrap inside (sorry, forgot to take a pic). For airplane food I must say I was pleasantly surprised. Who knew flying could be this good? So I’m on an early morning flight back from Thunder Bay to Toronto and once again I am surprised with the goodies. 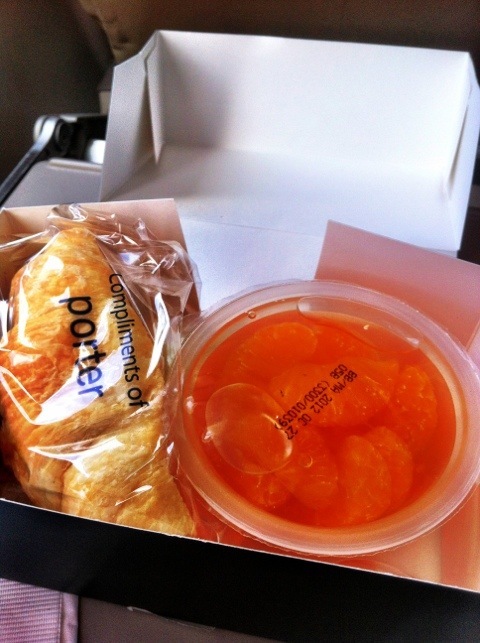 Yes…..breakfast on a plane….what? 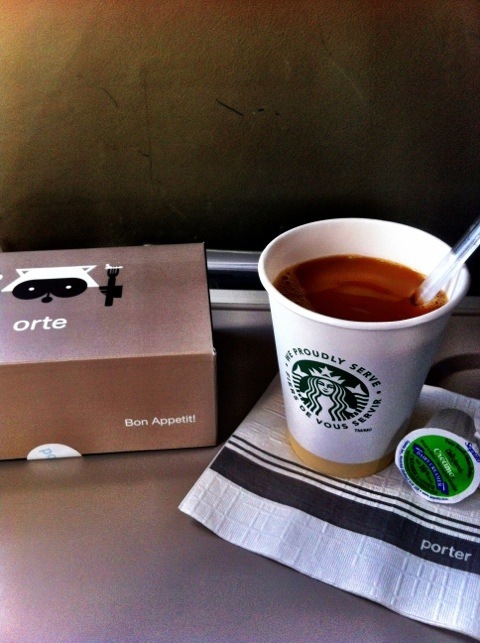 Indeed, not only did we get Starbucks coffee but a nice little boxed lunch with a croissant, jam and a fruit cup. This was such a delightful surprise this early in the morning. Especially since I was ready to doze off on the plane until a received this little box of sunshine. The fresh nap was also a nice added touch.